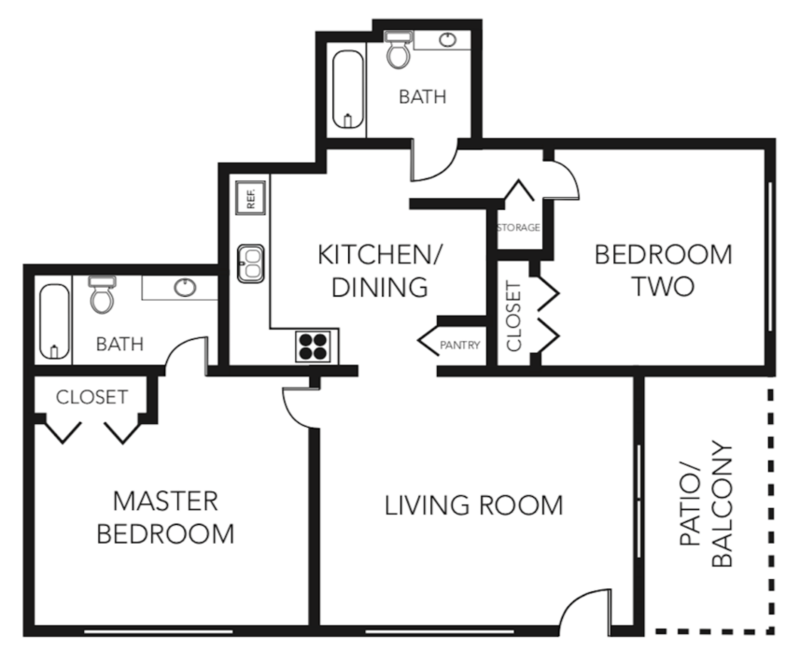 Tour today to see which floor plan best fits your needs. 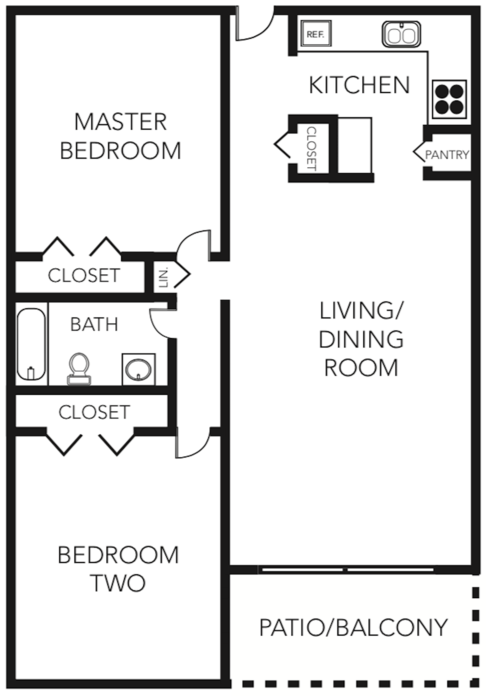 Your options abound with our variety of studio, one- and two-bedroom apartment residences. Designed with comfort and function in mind, each residence comes outfitted with honey oak cabinetry and modern finishes; a stainless steel appliance package, and open-concept living and dining room spaces. 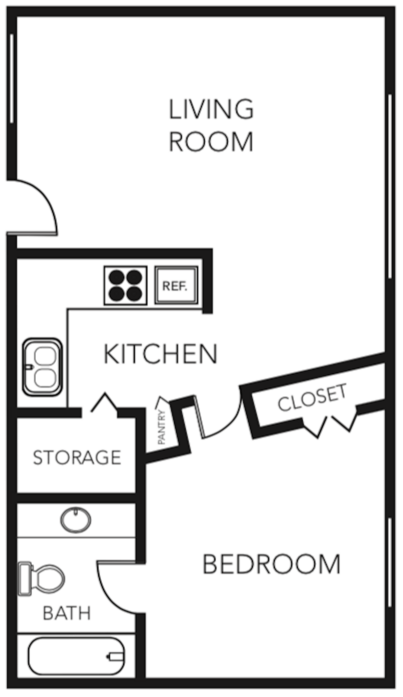 This cozy studio apartment comes equipped with a full, wraparound kitchen and ample closet space. 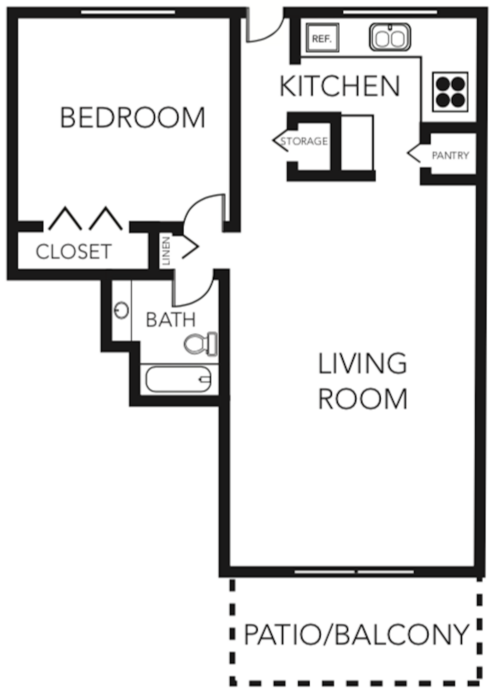 This floor plan is perfect for those looking for a cozy one bedroom that still offers enough space for guests. 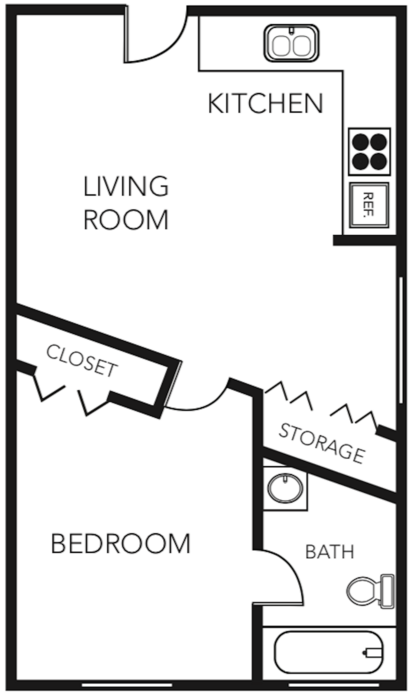 In addition to a wide living room area, you'll also enjoy ample closet space. 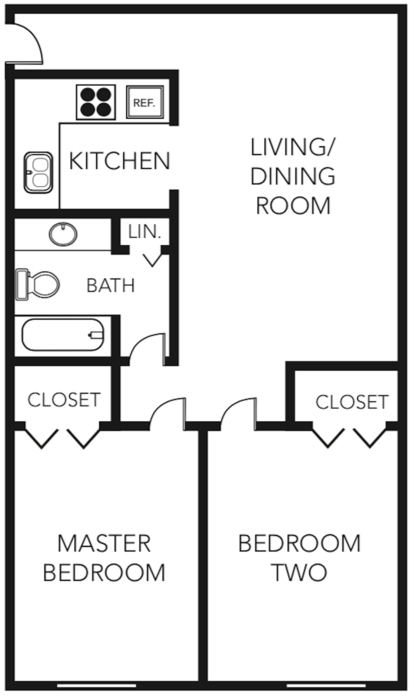 This cozy one bedroom's unique, angled design creates more space in the kitchen, living and dining area without sacrificing bedroom space. With an open-concept design for the common spaces, this one bedroom is an entertainer's dream. The modern kitchen overlooks a broad living room area, with a direct line of sight to the balcony or patio. Seaside Villas' largest one bedroom residence comes equipped with a spacious, contemporary kitchen that flows into an open and airy living room space. The comfortable kitchen also comes equipped with ample storage and pantry space. The highlight of this two bedroom residence is the open concept living and dining space that connects to the kitchen, making it an entertainer's dream. Each bedroom offers ample space for comfort and enjoyment, as well as direct access to the bathroom. 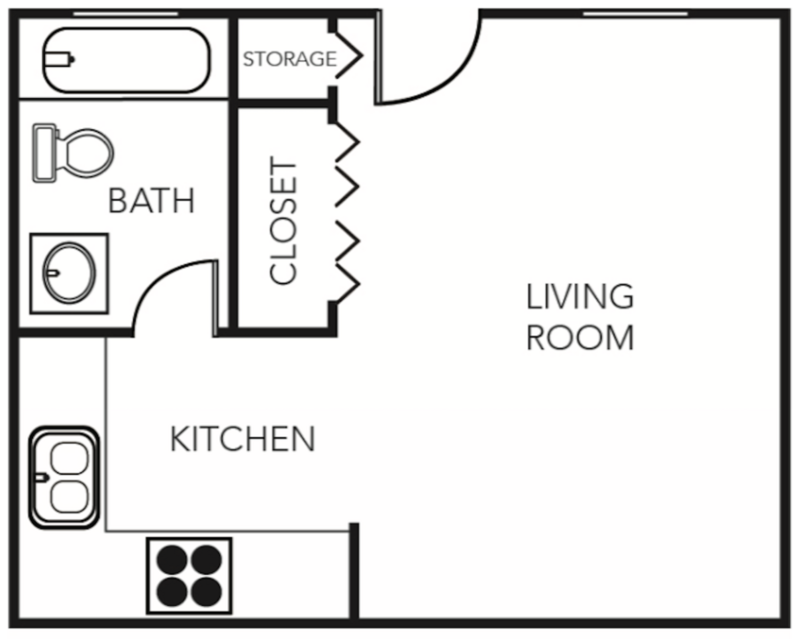 Designed for comfort and convenience, this floor plan offers a flow-through kitchen and dining/living room and ample closet space throughout. Designed with function and convenience in mind, this residence offers two side-by-side bedrooms that each open to the living room. The wraparound kitchen is both removed from the living room, yet seamlessly accessible. The heart of this two bedroom residence is the open and airy kitchen and living room, which also opens to the patio or balcony making it an entertainer's dream. Each bedroom offers ample space for comfort and enjoyment, as well as easy access to the central bathroom. Seaside Villas largest floor plan, the highlight of this residence is the spacious living room and dining area, which connects to a galley-style kitchen. 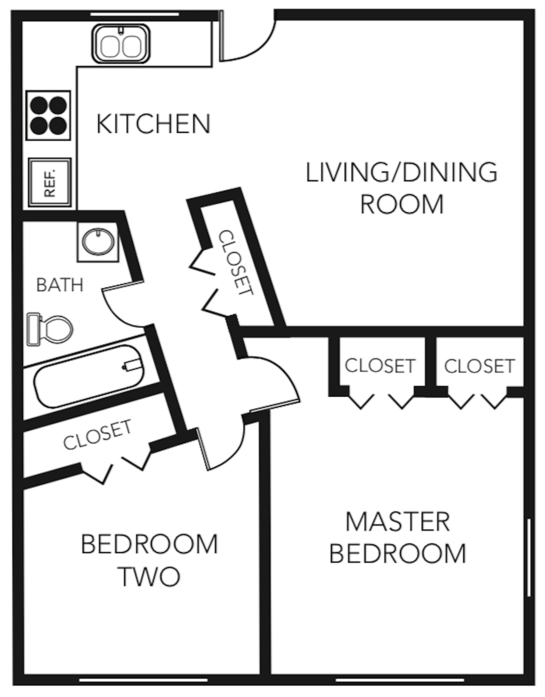 The two spacious bedrooms each come equipped with ample closet space. This unique design was created for those who want the best of both worlds - spacious common areas and bedrooms. 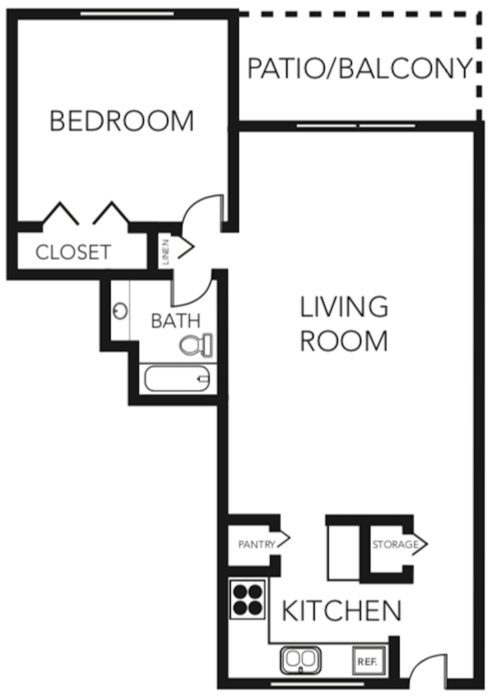 The spacious kitchen lies at the heart of the layout, with two spacious bedroom framing the living room.